A Eurovision song in my countdown is certainly a rarity. Very few songs from the competition have a long-standing durability and age well but Goodbye To Yesterday is in my Top 5 most played songs of all-time, loved the performance on the night - the vocals are great and instrumental is strong. The other is the debut from a then-unknown Daniel Bedingfield, a catchy garage track Gotta Get Thru This cemented itself as a hit very quickly. I always thought Daniel should have had a bigger career than his sister. Natasha deserves more success than she got, what a great performer she was. But Daniel faded so quickly into oblivion. 'Gloria' is great, I re-discovered it this year when it was featured in an episode of 'American Crime Story - The Assassination of Gianni Versace'. I feel like I should've seen the show through, I gave up after the first episode. That's a shame, I really enjoyed the show! 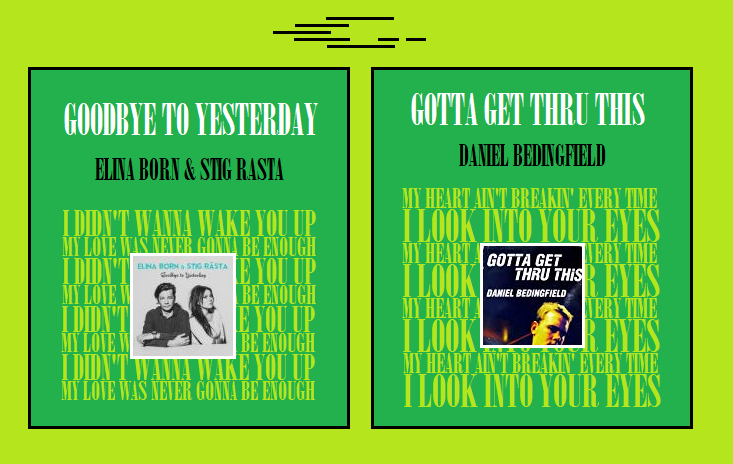 I liked 'Gotta Get Thru This' at the time, though I rarely listen to it nowadays, in contrast to 'If You're Not the One', which is my favourite Daniel Bedingfield song, by far. Sorry for the delay in update, been busy with work and Christmas etc. 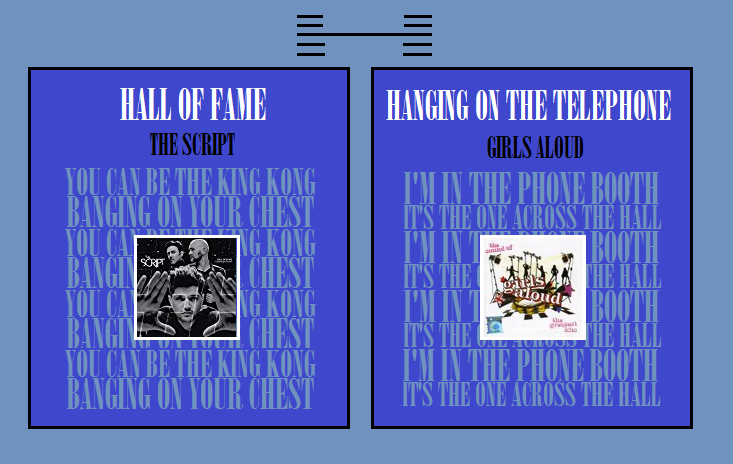 The Script aren't a band that I normally listen to or am interested by but Hall Of Fame is a great catchy pop-rock song. I do find will.i.am's contribution a bit unnecessary, just like will.i.am himself. Girls Aloud's version of Blondie's Hanging On The Telephone is also here, one of my favourite cover versions of theirs and I actually prefer it to the original (especially the production, vocals equal Blondie's ones to). The Script have better, but like HoF nonetheless. What's The Script's best song? I'm also a fan of Breakeven and Superheroes. 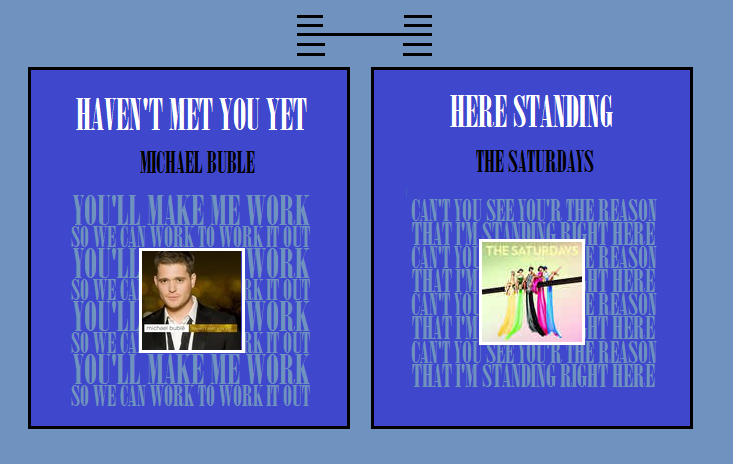 Who would have thought that Michael Buble would have produced such a timeless, upbeat, original song among his silky smooth cover versions, Haven't Met You Yet still gets regularly churned out on radio stations and has become his signature hit. Lesser-known song Here Standing is an album track by The Saturdays - it's my favourite ballad of theirs, beating out the single Issues. This one highlights their vocals better and has a crisp production to it. The Man Who Can't Be Moved or Breakeven, can't decide! Girls Aloud's version of Blondie's Hanging On The Telephone is also here, one of my favourite cover versions of theirs and I actually prefer it to the original (especially the production, vocals equal Blondie's ones to). "Gloria" is good! I went into it thinking that it wouldn't have been as good as the Glee Cast cover, but it was just as impressive! Great vocals! I liked Jessica's "Gods & Monsters" interpretation. It's better than the original, though the song itself is still so distinctly Lana Del Rey. "Goodbye to Yesterday" is divine, quite possibly my second favourite Eurovision discovery, after "Rise Like a Phoenix". "Gotta Get Thru This" is meh; I don't like it. Yeah, I honestly can't think of a song where will.i.am's vocal really adds value. "Hall of Fame" is okay. "Hanging on the Telephone" is basic by GA's standards. "Haven't Met You Yet" is lovely, and I think it's aged pretty well, too! It's a very Pete song! "Here Standing" is lovely, though the whole time I'm waiting for Bill Medley and Jennifer Warnes to jump in and start belting "(I've Had) The Time of My Life". I put Glitter & Gold on the UKMIX Spotify playlist if you checked that out. I love your love for Girl Overboard. I'd love a desription of what a Pete song is. I forget that you knew GtY - genuinely surprised it didn't do better in Eurovision. Glad you loved the original to Gloria - I gotta give props to Glee as a show for introducing so many old songs to a new generation of people. 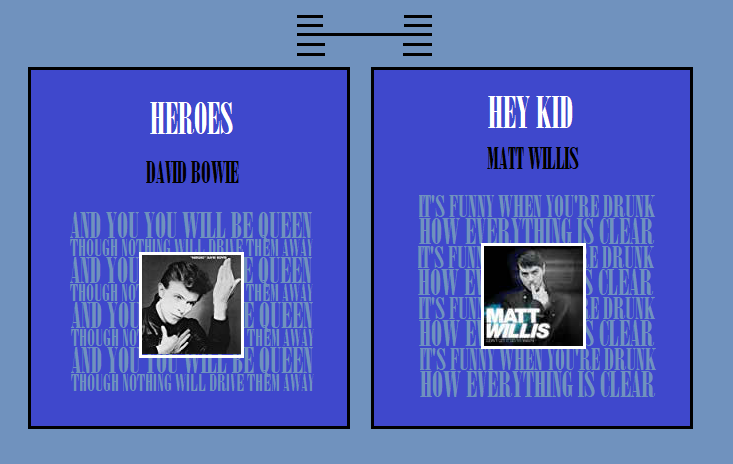 Heroes is one of Bowie's signature tunes and rightly so, husky vocals and meaningful lyrics equal a fantastic piece of music. The other song here is a lesser known 00s entry - former Busted member Matt Willis and his song Hey Kid which was featured in John Tucker Must Die - a great pop/rock song. "Heroes" is good. "Hey Kid" has a lovely message! Big, catchy chorus on 'structured' songs; warm vocals and earnest/endearing lyrics; eclectic/classic, musical-appropriate melody; and unstructured, hodgepodge arrangements. You have a wide-ranging taste, from the fabulous diva styling of a Barbra Streisand to obscure rock stuff, but most of the songs you love can fit within the aforementioned description. I love that about Glee (and American Idol)! What a babe you are, such a good way with words. Adele stuns with awesome vocals in my favourite song of hers Hometown Glory. She has many great ballads and is always on point with her vocals but this was the first track of hers that I truly fell in love with. 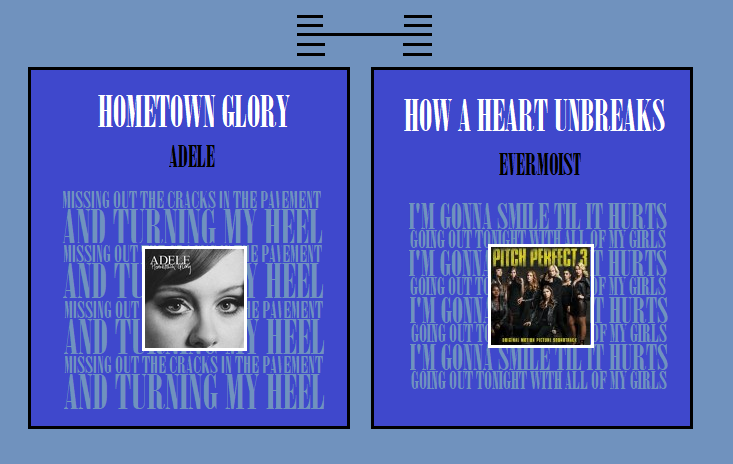 From the Pitch Perfect soundtrack, How A Heart Unbreaks is quite an odd inclusion in my mix. It's got a great mix of pop and rock vibes, with some solid vocals. British megaband Take That album track How Did It Come To This uses Jason Orange's vocals - one of the few Take That tracks to do so, it's a catchy little ditty, with a cool story behind it and fun lyrics. 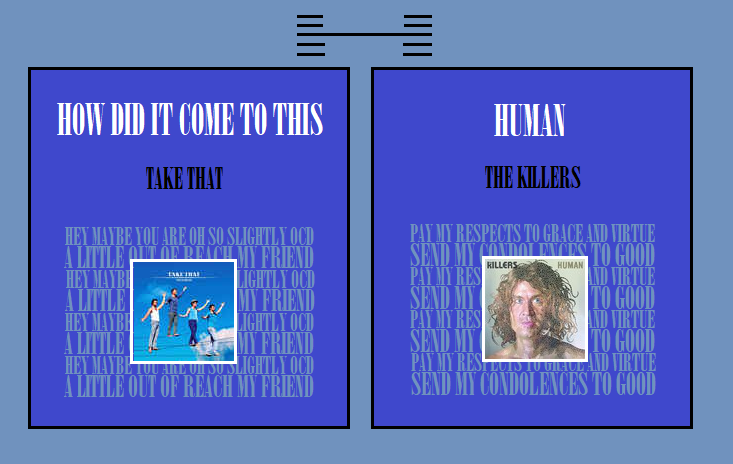 The Killers' Human is the next song - I believe it placed within my all-time Top 20 songs, and it still remains there today. 'Human' is nice though overplayed. Don't know that Take That song. A new era for UKMIX and a new design for my chart. This guy? The one who was married to Jessica Simspon? Yeah. Nick Lachey had a very good solo album back in the 00s. With a very pop-rock vibe that was trendy at the time, the album still holds up relatively well today. This song was the second single from his album and a definite highlight. His vocals sound good and the lyrics within the verses are some of my favourites. A song I discovered thanks to Benny's ABBA countdown a few years back. It was unlike anything I'd ever heard from the band before, it has an unusual structure and yet still keeps the unique ABBA charms and vocals that people are so accustomed to. This song would definitely rank in my Top 5 of all-time ABBA songs, and my favourite non-single of theirs. Great ABBA classic from their best studio album! I need to check out that Nick Lachey song. I only know 'What's Left of Me' from him (apart from the 98 Degrees stuff), and I like that one a lot. You're incredible ABBA taste certainly rubbed off on me. A very musical-orientated post here. The first song being taken from Robbie Williams' second swing album (and his best album overall IMO). Here he teams up with Olly Murs for a big band version of 'The Jungle Book' classic I Wan'na Be Like You. Both of them have powerful vocals to match the music and the musical modernizing of this song into the 21st century is great. Another musical song here, this time from 'Rent', it's the I'll Cover You (Reprise), a song which is sung at one of the characters' funerals. Mainly sung by Jesse L. Martin, you can certainly hear the emotion in his voice throughout this song. The song then incorporates elements of 'Rent's signature Seasons Of Love to create an incredible amalgamation of both songs in its finished product.